Enter the cemetery at your own risk. Thousands of people are buried in Hollywood Cemetery's four major sections and a few smaller sections. For a few years, I've been documenting and photographing as many graves as I can find. Along with thousands of records already created by my friend Judy Wilson, I hope to create a directory so that people can find the general location of their ancestors' graves. 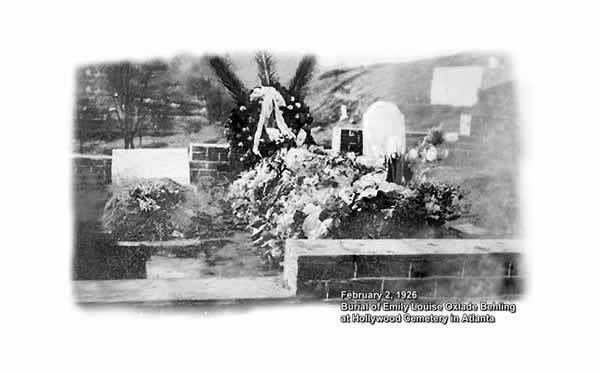 Atlanta's Hollywood Cemetery was established October 14, 1890 after 84 acres were purchased by charter members for $25,000. Within a few years, the company was in financial trouble and in danger of insolvency. At that time, the company had sold 2000 lots and more than 1000 burials had taken place at the cemetery. Newspapers of the day tell several interesting stories about the place, including one about a man who decided to dig up his wife and move her to a different plot. 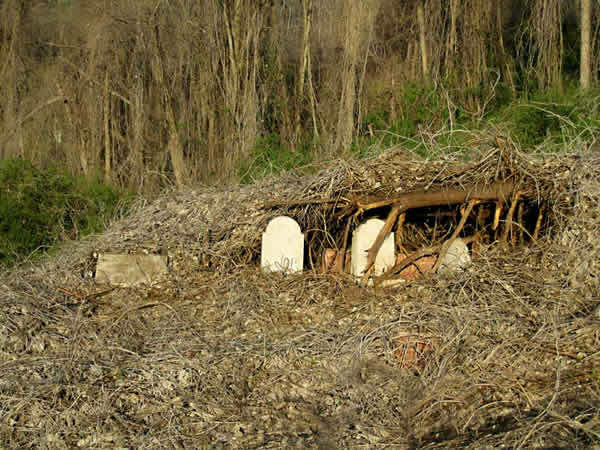 While looking for graves, I found a set of four under a fallen tree covered with winter's brown kudzu vines. After posting the images on findagrave.com, Descendent Sonya Behling Eason provided a photograph of a 1926 burial at that exact site. Three of the four gravestones are visible in 1926. The fourth would eventually mark the grave of a man who was still alive in 1926. Here's the site in 2011 and the same location 85 years ago. Both pictures show the same view, but in 1926, the hillside was bare. Today, it's a jungle. You can see the brick wall surrounding the plot in both images. 1926: The rectangular shape at the upper right is the front surface of a wall for a separate plot. You can see what looks like a gravestone sticking up above the wall. That plot and its concrete wall are still there today, but hidden by the brambles in the background. Photo courtesy of Sonya Behling Eason. 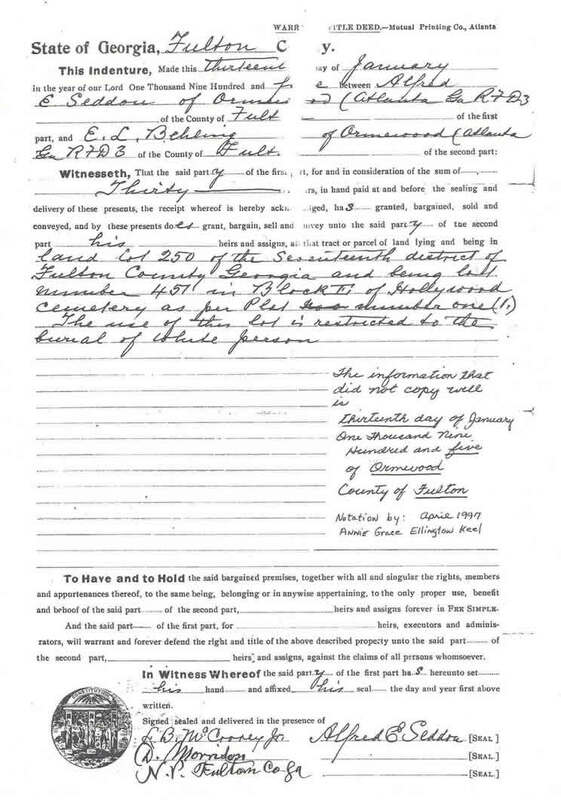 The deed to the property. It cost a grand total of $30 in 1904, and was for the "burial of white persons only." Courtesy of Sonya Behling Eason.